Brock offers a variety of stiffened flat-bottom and hopper-bottom storage silos including the company's line of EVEREST® E-Series Grain Silos. Brock's decades of storage design and manufacturing experience helps to make Brock's stiffened grain storage products Different by Design™! Because of that experience, BROCK® Stiffened Grain Storage Silos offer commercial users the best built-in value over the life of the product. Elevate your grain management to new heights with Brock’s EVEREST® E-Series Grain Silos! The new EVEREST E-Series offers the tallest silos and has some of the highest grain-holding capacities available. More models and choices so you can get the silo you need. Single silo capacities range up to 43,070 cubic meters (1.3 million bushels) with Brock's EVEREST® E-Series line of silos. Brock's industry-leading five-year warranty program on stiffened grain silos - we believe we have the best warranty in the industry! See Brock’s full written warranty for complete warranty details. 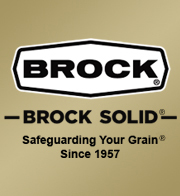 If you are considering long-term, high-quality grain storage, get the differences only Brock provides.